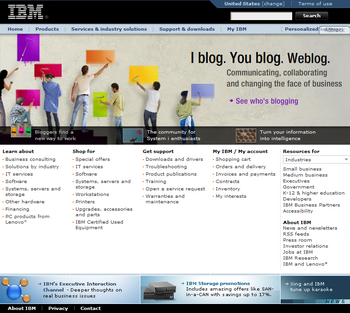 Via Keith Instone I learned that IBM’s US frontpage story today is about blogs. Blogs are an important factor of IBM’s public face. Also worth mentioning is the blogging policy and guidelines, which I’ll get back to in the next post called “Blogging policy and guidelines”. This entry was posted by Jesper Rønn-Jensen	on Thursday, October 19th, 2006 at 22:27 (GMT-1)	and is filed under Blogging, justaddwater.dk. You can follow any responses to this entry through the RSS 2.0 feed. Both comments and pings are currently closed.